Jade Guan Yin, Buddha of Compassion pendant. Guan Yin, Buddha of Compassion, sits on an open lotus in meditation. She holds a vase filled with compassion. This jade pendant always touches my spirit, and my brain with the energy to get into a meditative state. 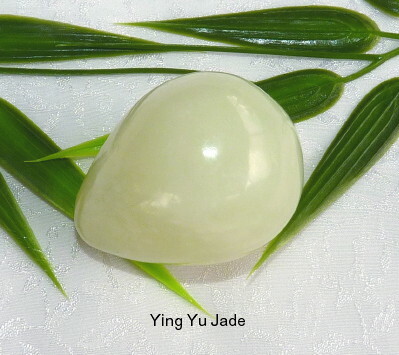 Jade has qi energy, and the white jade is related to the lung meridian. White jade helps balance the lung meridian, physically to improve breathing, asthma, allergies; and emotionally to heal sadness and grief, and instill calmness of your spirit. 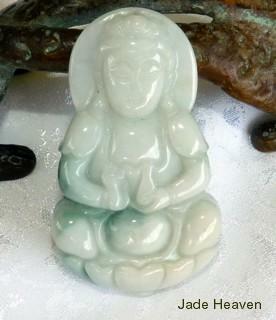 The green vein in the jade is related to the liver meridian, to balance feelings of anger and further calm your spirit. When I hold this jade pendant, touch it, it's almost like a mini meditation session. You don't have an open lotus to sit on. You don't have chimes, or metal bowls to "chime". You don't even have a meditation cushion. And you think you don't have a quiet space, or the time to meditate. But you want to do it. Give yourself 10 minutes. You can set a timer, or use the timer on your smart phone to make a gentle chime or sound when 10 minutes is over. Find a comfortable place to sit for 10 minutes. I have a big pillow I put on the floor, and sit cross legged, but you can sit anywhere that allows you to sit straight with good posture, but also relax and be comfortable. Close your eyes, or almost close them. Breathe in extending your abdomen, pause, breathe out. Focus on your breath, let thoughts, sounds, come and go. If you feel tightness in your body, let it relax. Don't "do" or "think" anything. Enjoy the sensation of peace. Try to continue for 10 minutes, but if you can't, that's alright because you started. If the experience felt good, do it again tomorrow. And the next day. It doesn't matter how long you do it. The brain changes when you are in a state of meditation. 20 minutes is a good goal for a beginner. If the experience doesn't feel good, try it again another time when you feel ready. You don't have to do it every day. And you don't have to do it at a certain time, certain place, with props or equipment. If you can incorporate meditation into you lifestyle, that's more helpful to you than going to a class when you can, or using a specific meditation program. You will know you are ready to move on when your meditation feels good and you look forward to doing it. To move on, add extra time. And explore more about meditation. Meditate While Holding Something - Jade Has Good Energy for This! My best time to meditate is around 11 am. That's the time when I'm usually working on my jade web sites. Sometimes I'm working with a piece of jade that has such good qi energy, it moves me to sit down and start the meditation. When I'm working with the jade eggs, there are so many of them in my inventory that means a lot of qi energy. I don't always have a "purpose" when I meditate, and that's when holding something special is helpful. I hold the jade egg in my hands, which are linked with the fingers and just "sit" and close my eyes. I "see" the jade egg, I feel the qi energy, and I simply "go" with it. The meditation is different all the time. When I am having a painful day, I feel the pain subside. When I am anxious, feel overwhelmed and have a lot of work I need to do, I feel my breathing get deeper, and relaxation follows. When I don't know what I want to meditate about, I see a picture of the egg in front of me, and just go with whatever shows next. It's usually an issue that is very satisfying. The large jade eggs fit good in the hand and don't interfere with hands and fingers being together for the meditation practice. The jade in the eggs is genuine and natural Chinese jade, the kind of jade Chinese doctors have used for centuries. It's like "holding your medicine". I also wear a jade bangle bracelet all the time, although I change it periodically when I need different jade energy for my life at the time. When meditating, it's easy to hold a part of the jade bangle with a finger and get the qi energy from it to magnify your meditation practice. Ying Yu Jade has good qi energy Chinese jade and Burmese jadeite that is beautiful to wear, and can help boost your meditation practice. The best jade for you is the piece you keep coming back to look at, perhaps even drool a little bit, which means it has the qi energy beneficial to you. There are jade rings, jade pendants, small jade carvings, beads, necklaces. Don't rush to purchase, take your time until you find what appeals to you.